My husband was really excited when he opened this up a bit early so I could get the giveaway started for father's day. I also bought him a roll bag for his tools as well as a bucket boss organizer from another company for father's day. He is in tool heaven. Being disabled makes it a bit harder for him to lug everything everywhere so I thought if he had one of these he would be able to just ask me or one of the children to bring his bucket and he would most likely have everything he needed to do a job around the house, without endangering himself to try and go down the stairs to get the right products and then work his way upstairs to do the job. You can see video review below. 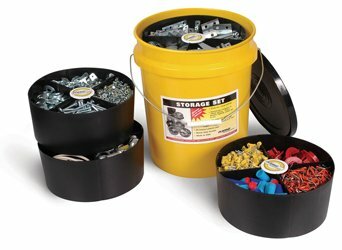 Winner will win 1 King Innovation Storage Bucket worth 34.71. MarksvilleandMe is not responsible for prize distribution that will come from King Innovation. Open to residents of the USA from 6/1-6/18/2015 12:00 AM EST. Winner will have 24 hours to respond or another winner be chosen. MarksvilleandMe would like to wish everyone who enters Good Luck! Disclosure: MarksvilleandMe received one or more of the products mentioned above as part of a promotion with Tomoson and King Innovation. Regardless, MarksvilleandMe only recommends products or services we use personally and believe will be good for our readers. Some of the links in the article may be “affiliate links.” This means if you click on the link and purchase the item, I will receive compensation. If you would like MarksvilleandMe to review a product or service please contact us at marksvilleandme@gmail.com.